Veterans Week corresponds with the week prior to Veterans Day. This is an opportunity to celebrate the past and present service of UMD's student veterans and the sacrifice and service given to our country. This year, student veterans will be able to earn a free TerpVets sweatshirt! Hooded Sweatshirts will be given to the fifty student veterans that attend the most events during Veterans Week. Make sure to sign in at each event you attend. Additionally, there will be daily giveaways at various events. coming up the following week. present, come to the UMD football game celebrating military service. way to spend a Sunday with family and friends. meditation session in the Veteran Center. get credit for attending this event. Put on a pack and join us as we ruck around campus. Meet at Testudo in the Stamp. Veterans and supporters alike are all welcome. as we build the bonds that support successful transitions. The attire is business causal. underserved community in Washington D.C.
food credit. Tickets can be purchased at the Stamp Box Office outside of the Hoff theater. 2013 Veterans Scholarship Reception & Football Game on November 9th. Thank you for attending our 6th Annual Veterans Reception at the University of Maryland. The reception provided a wonderful opportunity to celebrate our progress but more importantly, to show our gratitude to the men and women in our UMD family who have sacrificed so much. We are especially grateful for the ongoing support of our alumni and friends that has helped to launch our Veterans Initiative. This year alone, we provided $70,000 in scholarships to 21 deserving members of the UMD veteran student community. 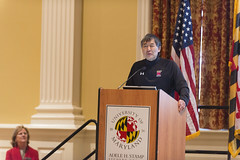 Thank you so much for all you have done for the veteran community at the University of Maryland. I am glad that you were able to join us and hope you enjoyed the reception!